This new casino has based themselves on New York, and we can’t think of a better fit than with the city that never sleeps. You’ll find everything you need here thanks to a huge collection of titles from the biggest names in the business. Plus there is a fun rewards scheme with a quirky theme that fits well with the style of this casino. The casino has a distinct design with the New York skyline dominating the background. The logo proudly displays the Statue of Liberty and players can work their way through the various districts as they progress on their casino journey. This casino like many others has a loyalty programme but NYspins has got creative with theirs, and you will love making your way through the ranks and enjoying the sites of the big city as you go. The first stop is Manhattan, followed by the Empire State Building then onto Broadway. There are plenty of levels so it’ll keep you interested, there’s even Trump Tower if you fancy a visit there! You can unlock the various levels by earning Experience Points as you play, wager and complete the featured games. 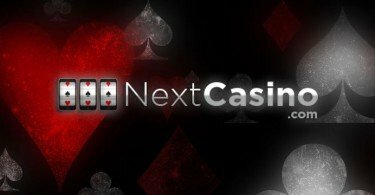 The site is licensed by the Malta Gaming Authority and is operated by SuprNation Limited whom you may know from NYspins’ sister site Voodoo Dreams Casino. They offer live chat and email support although it’s not 24 hours. Info is a little limited on the site which is one of the few faults we can find with the place. Luckily it’s easy to use so hopefully, you won’t run into any issues. If you wish to make a deposit, you can do so via Visa, MasterCard, EnterCash, Euteller, iDEAL, Neteller, Skrill, Trustly and Zimpler. 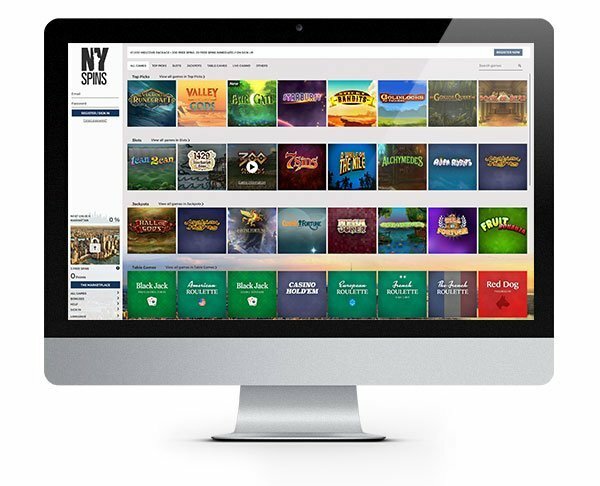 The NYspins casino games collection features over 600 titles with slots, jackpots, card games, table games, video poker and live dealer games all well represented. 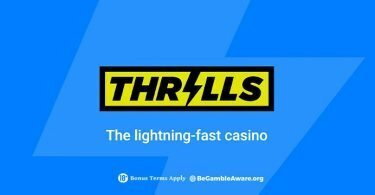 They have teamed up with some serious big hitters including Microgaming, NetEnt and Betsoft so there are heaps of recognisable slots that fans will enjoy playing. Just a few highlights from the slots collection are Starburst, Sticky Bandit, Spina Colada, Immortal Romance, Book of Dead, Dead or Alive and Piggy Riches. They also boast some of the biggest jackpots. 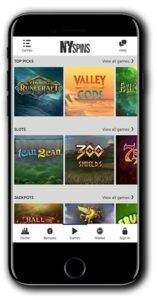 Check out Hall of Gods, Arabian Nights and Mega Fortune. 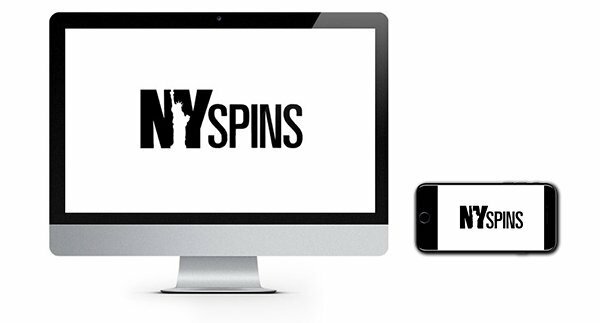 Will NYspins bring you fame and fortune? We can’t promise that, but we can guarantee you’ll have a fun time trying. Take a trip to NYspins Casino for FREE and enjoy the bright lights of the big city atmosphere with this no deposit bonus. Just sign up using our link below and collect 20 No Deposit Free Spins which you can choose to use on the awesome BOOK OF DEAD slot! Step into the world of NYspins Casino and collect your NO DEPOSIT FREE SPINS today! IMPORTANT NOTICE – Make sure you are aware of gambling regulations in your country of residence and that you are not playing from a restricted country before you register at NYspins Casino. Enjoy the bright lights of NYspins Casino for FREE with this no deposit spins offer!